“Alain Ducasse embodies a culinary philosophy that is very similar to my own. Preparing food is first and foremost a craft for him: The product takes centre-stage, with no room for airs and graces in the kitchen,” said Eckart Witzigmann, commenting on the jury’s decision. Alain Ducasse represents the revival of haute cuisine unlike any other and makes the product the focal point in a radical way. He is the first chef to create and serve an all-vegetarian menu worthy of three stars. Ducasse thinks far beyond the plate. Food is for him a fundamental need with the status of a civil liberty. Alain Ducasse is the only chef to have earned the highest accolade of three Michelin stars for three different restaurants: “Le Louis XV” in Monte Carlo; “Le Plaza Athénée” in Paris and the “Alain Ducasse at the Essex House” in New York City. Alain Ducasse is the only chef to have earned the highest accolade of three Michelin stars for three different restaurants: “Le Louis XV” in Monte Carlo; “Le Plaza Athénée” in Paris and the “Alain Ducasse at the Essex House” in New York City. With an approach more prêt-à-porter than haute couture, Ducasse started out opening bistros in his name without aspiring to the level of a starred restaurant. In this way, he was able to share his culinary philosophy with a wide audience. Today, he operates 26 restaurants worldwide. The renowned Eckart Witzigmann and his international jury awarded the accolade in honour of Marte’s extraordinary career path from dishwasher to Michelin-starred chef, and of Orlando’s bold decision, as a manager, to support her from the very beginning. María Marte’s cuisine stands for an innovative concept that melds contemporary cooking methods with Caribbean elements to create a fascinating Mediterranean-Latin-American fusion. Outstanding flavour combinations and original presentation are her trademark and, in collaboration with her sponsor Luisa Orlando, managing director of El Club Allard, she is realising her dream of young, exciting cuisine coupled with superior dining culture. Born in the Dominican Republic, María Marte is linked to Spain’s Luisa Orlando by a unique story. After immigrating to Spain in 2003, Marte took on a job as a cleaner and dishwasher at El Club Allard, though her ambition from the outset was to become a chef. Defying hurdles and prejudices, she managed to fight her way into a job as kitchen assistant. Already in 2006, she became the right-hand woman to chef Diego Guerrero, who was awarded the restaurant’s first Michelin star in 2007 and its second in 2011. However, in the wake of Guererro’s unexpected departure in 2013, managing director Orlando decided to take a bold and unprecedented step: defying all doubts, she appointed the erstwhile dishwasher María Marte to head chef. Their success is a testimony to the credentials of both women: together, they have successfully defended the two-Michelin star rating of El Club Allard. Moreover, Marte is the only female in Latin America today to hold two Michelin stars. “This story is like a fairytale. But it’s also much more than that: these two ladies have shown that innovation and quality will always prevail. 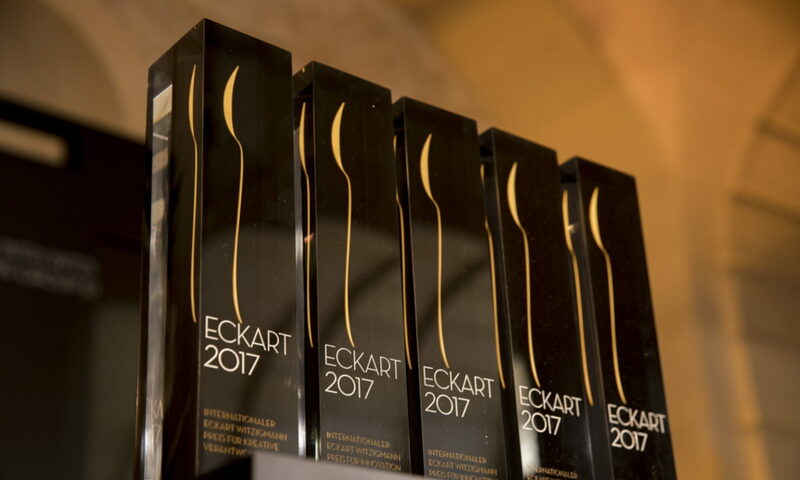 Today, we would like to honour the courage and unbending will with which María Marte and Luisa Orlando have pursued their goals by presenting them with the ECKART 2017,” said Eckart Witzigmann, after whom the awards are named, as he explained the reasons for the jury’s choice. In 2006, the well-known marketing and music-video director Tiffany Persons travelled to Sierra Leone for the first time to film a documentary. She spent three months living in the rural, diamond-mining mountain town of Kono, where she witnessed the community’s extremely difficult living and working conditions for herself. Impressed by the enthusiasm and cheerfulness of local people in the most adverse of conditions, Persons founded Shine On Sierra Leone (SOSL) in 2007 to raise money for building urgently-needed schools. The organisation has continued to grow ever since: Today, the non-profit SOSL is committed to promoting wider access to education, healthcare, microfinancing and regional culture, and providing sustainable building and agricultural programmes for the communities of Sierra Leone and its people.